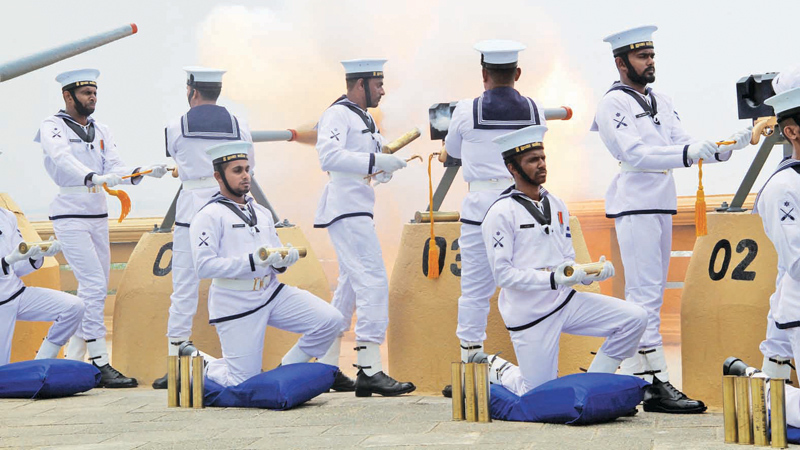 At National Independence Day celebrations, the Sri Lanka Navy (SLN) performed a 25-gun salute to the nation, at the Lighthouse premises at Navy Headquarters yesterday. The gun salute was held under the command of Captain Mahesh De Silva. SLN gunners used four 52-millimetre-calibre guns. According to the Navy media spokesperson Lieutenant Commander Isuru Sooriyabandara, according to tradition, the gunners did not have watches to determine the time gap of five seconds between the gunshots. Instead they say, “If I wasn’t a gunner, I wouldn’t be here, No. 1 fire,” and fire the shot, as it takes almost five seconds to say the sentence. They fired the 25 gunshots in the same manner. The history of saluting by heavy gunshots or artillery goes back to the 14th century. The Sri Lanka Navy performed this gun salute for the first time in 1948, when they fired 15 gunshots in Galle Face to commemorate the very first Independence Day. It was in 1937 that the Sri Lanka Navy was established as Ceylon Naval Volunteer Force (CNVF) and later renamed as the Ceylon Royal Naval Volunteer Reserve (CRNVR), after union with the Royal Navy. It was renamed again in 1950 as the Royal Ceylon Navy (RCN). After the republican Constitution in 1972, its name was changed to the present Sri Lanka Navy. Commander Sudeera Dharmadasa was the supervisor of the firing squad of the gun salute, while Lieutenant Commander Shan Arambewela was the officer in charge and chief petty officer S.M.R.N. Bandara was the gun instructor.